With a promising El Nino influenced winter in the making, Mother Nature has a way of teasing us in November here at Lake Tahoe. Ahead of the first turn of the chairlifts and before the pumpkin pie and turkey goes into the oven, brisk mornings and a glow of white on the mountaintops often melt into deliciously warm afternoons. The lake, free of the summer boat traffic, is the perfect mirror for Tahoe’s ridiculously blue skies. 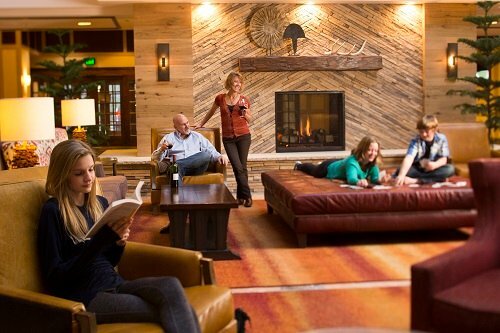 Have you booked your stay at Lake Tahoe Resort Hotel yet? Whether you plan a midweek getaway, a weekend retreat, or want to be the first to carve out the first turns of the season, make your reservations today. Enjoy the locals favorite season this fall and early winter with special, limited rates for November and December. Use Promo Codes: 15nov, or 15dec and book your suite today for up to 35 percent off. By Thanksgiving skis and boards will be waxed and ready to ride here in Lake Tahoe. Heavenly Mountain Resort is anticipating an early winter by setting an opening date of Friday, Nov. 20, with other nearby resorts soon to follow. See the pros turn out to hold ‘em and fold ‘em when the World Series of Poker Circuit returns to Harveys Lake Tahoe Poker Room, Oct. 29 through Nov. 8. Or get in the holiday spirit in Valhalla Tahoe’s grand hall during the 20th Annual Valhalla Holiday Faire, Nov. 20-22. There’s no better way to see Lake Tahoe than from the top. Lace up those hiking boots, pack a walking stick or ski poles and pick a trail. Fuel up on the free breakfast buffet you’ll be ready for an adventure-filled day exploring Lake Tahoe. Here are a few recommended by us: Van Sickle Bi-State Park, Tahoe Rim Trail, Mt. Tallac, Castle Rock Trail, Round Top Lake Trail, Fourth of July Lake, Echo Lakes, Fallen Leaf Lake, Grass Lake and Angora Lakes. If you love being on two wheels, Lake Tahoe has mountain bike trails for you to explore, at least until the snow flies. Views and challenges can be found on any of the paths. Whether you’re looking for shorter rides or longer adventures, Lake Tahoe delivers. Some trails that we recommend are: Mr. Toad’s Wild Ride (10 miles); Corral, with Sidewinder option (5+ miles); The Bench (12.5 miles); and Powerline Trail (6.5+ miles). Lake Tahoe in all its fall splendor awaits.